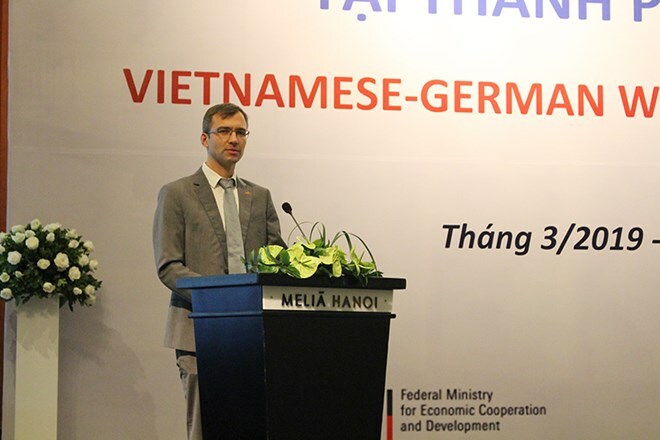 Hanoi (VNA) – A workshop on business connectivity and technology took place in Hanoi on March 20 within the framework of the Vietnamese-German Water Forum. Vice President and General Secretary of the Vietnam Water Supply Association (VWSA) Nguyen Hong Tien said that the workshop aims to put forward synchronous measures for water management in Vietnam to help solve water-related challenges, attract more investments from Germany into Hanoi, and help the two countries’ enterprises connect. According to First Secretary at the German Embassy in Hanoi Jorg Ruger, Germany has become a leading important partner of Vietnam in the European Union in terms of politics and economics. The two nations have cooperated in many fields, including industry, science-technology and education, with many effective projects in the field of water supply and drainage. The event offered a chance for German Water Partnership (GWP) members to approach new markets in Southeast Asia, particularly Vietnam, while fostering information exchange and dialogue between the two sides, and stepping up international collaboration through vocational training and training programmes, Ruger added. At the workshop, difficulties in water supply and drainage in Vietnam were put on the table for discussion.